Making lots of progress on the Valley Line these past few weeks, especially with some particularly timely help over this past weekend from Roman and Bill. I have a shake-down ops session scheduled for Friday and am trying to get as much done as possible before then. So - alas! - blog time has suffered as I spend whatever non-dayjob (and non-honeydo) time I have working on the layout. I hope to have at least some progress pics to post soon. Feeders: 20ga solid copper, connected to pigtails using wirenuts. My question is whether there's a difference - electrically - between wiring many feeders together to one pigtail and bus connection versus wiring feeders one-by-one to the bus. I'm showing just one side of the busline for simplicity. Of course, there's a whole other line - and associated feeders - to make a complete circuit. I don't think there should be much difference, if any. But I know just enough about electricity to be dangerous to know that this may create a resistance issue, at least hypothetically. But does it really matter in practice? 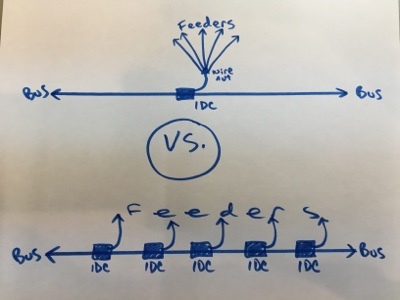 Credit goes to Craig Bisgeier for the idea of wiring many feeders together - I just don't know if there's a limit to how many you can do together at once. If you have any additional suggestions and/or are willing to share how you do your wiring, please share in the comments! Well, it's not a potential resistance issue, but a current one. You're dropping a lot of feeders to counter a resistance issue with the track. Go back to your basic circuits, and this is a parallel circuit. You have a pipe (either the main buss, or the pigtail) that is providing electricity to a bunch of other devices (the feeders) independently, instead of the electricity going through each device before reaching the next device which would be a series). In a parallel circuit the voltage is consistent to all components, but the current (amps) are divided between them. In a series connection, you'd have to worry about resistance because each component would reduce the voltage to the next component. So, is this a problematic approach? It depends on the size of your pipe. Your pigtail feeder off of the main bus is smaller than the main bus, and thus has less current. You just have to make sure you have enough current for all of the feeders. The reality is that the current is all flowing to the same circuit (the track). Your current and amp requirements are really divided by the locomotives on that track. The reason we're doing all of the feeders is because the wires and especially the track DO have resistance. So we're trying to get the voltage and current to be consistent through all of the track. But putting feeders every 3 feet, we're able to do that. So yes, there's a difference - you're starting with a smaller pipe. So if you split it between too many feeders, you'll potentially reduce the amount of electricity to that section of the track. But with overflow from adjacent sections, you won't have any real issues. I suppose we could take the time to calculate the exact electrical needs and ensure that the pipes (bus, pigtails, and feeders) are all of sufficient size. But I think we already did a generally assessment when selecting our wire gauges. You could also dummy up one pigtail with the maximum number of feeders you intend to use, and do it at the farthest point on your layout from your power. Then test each feeder, they should have identical amounts of voltage and current to each feeder, and you want to ensure that it's sufficient. Then attach the feeders to the track and test again. The voltage may actually be higher from overflow from adjacent connections along the track.